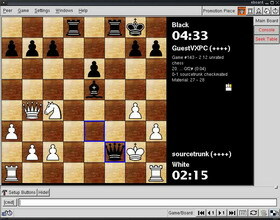 eBoard is a chess board interface for ICS that supports XBoard protocol v2-compliant engines, as well as engine support for GNU Chess 4, Sjeng, and Crafty. eBoard is the newcomer to the scene with the first stable version released in May 2001. For a program that has only been in development a few months this is a remarkable program. On startup you are presented with an attractive chess board. The default colors are well chosen and the pieces are clear (and are almost identical to Xboard’s). The first thing to strike you is that this is a GNOME application. GNOME is a free and easy-to-use desktop environment which rivals KDE as the most popular graphical enironment for Linux. Being a GNOME application you do need a recent version of the GTK+ library. Fortunately the latest Linux distributions (Debian 2.2r3, RedHat 7.1 and Mandrake 8.0) have at least the recommended version of this library. Although eboard is under heavy development it already has a good feature set. Besides regular chess it supports chess variants such as suicide, crazyhouse and bughouse. Other variants are supported, with some exceptions. The program can observe and examine games and the vast majority of the features available in FICS are already supported. The most important question is how does eboard function as a chess interface. eboard supports both click-and click and click-and drag and was both a pleasure to play and watch chess with. Response was good which helped ensure that few mouse slips were made. The piece sets, supplied with eboard, are a little sub-standard but this is not so important as the standard vectorised pieces have great clarity. Eboard has a number of features which sets it apart from the other chess interfaces on review. The two features that are particulary worth mentioning are the colored FICS output and the seek graph. Colored text makes it much easy to identify channel tells, shouts, chess shouts, personal tells etc. Combined with scroll locking on the text pane and a bash like history this makes eboard a pleasure to have a conversation with other players. Of course there is room for improvement. I would like to be able to customise the fonts and colors of channels to my own personal preference. The seek graph – or should I say seek table, shows all available requests for games which match your formula. What makes this feature better than the server’s “sought” command is that it updates automatically and by clicking on an entry you automatically accept the seek. I imagined the “seek graph” was going to show a graphical representation of seeks, like the Windows client BlitzIn does. Maybe this will come in a later release? Not unexpectedly there are many bugs in eboard, this is after all a development release. Some of them are easily avoided. For example eboard will crash if you try to use a chess engine that is not installed. There are also many features that I would love to be added includinga graphical seek window, buttons (for common commands), smart boards, hyperlinks in the console, PGN showing completed event and site fields etc. But what with the scripting support, the on the fly board resizes and the aforementioned features there is already an excellent foundation for future development.